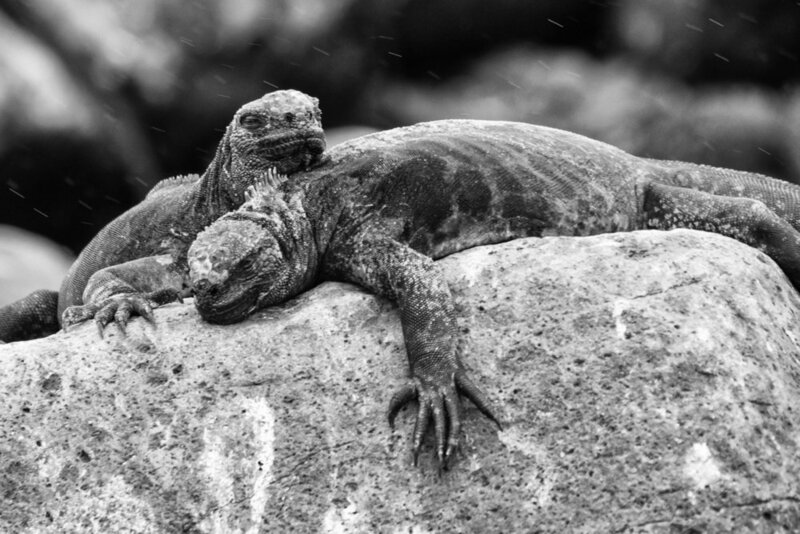 Join us on this photographic adventure of a lifetime, to one of the world's premier wildlife and landscape destinations, The Galápagos Islands. These islands have been preserved so well that they offer a unique window into the past, resulting in an ecosystem in which it will be as if you are invisible to the wildlife. You will find yourself in amazing close proximity to the wildlife! Naturalists will explain the animal behaviors while our two photography pros instruct you on the best techniques used for capturing memorable and meaningful imagery. We'll have eight days and seven nights aboard our own private and exclusive yacht, the 14-passenger Natural Paradise. We'll have a naturalist guide with us in addition to our leaders, Juan Pons and Lisa LaPointe, and will have access to areas that the big boats can't get to, and most importantly (as long as we follow the rules of the Galápagos National Park), we have the ability to go ashore on our own schedule, so we won't miss the best light and sightings. And with photography as our priority, we’ll make sure that mealtimes are scheduled around our shoots, not during! We'll walk in the footsteps of Charles Darwin who visited here in the 1830's on the HMS Beagle, and we'll try to channel his experiences as he formulated his theory of natural selection. Just some of the wildlife to be photographed are the blue-footed booby birds, red-footed booby birds, masked booby birds, penguins, land iguanas, marine iguanas, lava lizards, sea lions, red-chested frigate birds, flamingos, finches, tropic birds, lava gulls, and giant tortoises. If you like snorkeling, then there is even more marine wildlife to photograph, such as sharks, rays, Galápagos penguins, and countless fish. Snorkel gear will always available on our yacht! We'll maximize our shooting time with the best photo ops—getting up early for sweet light and chasing it to sunset. We'll have the option each night for critiques and instruction from the pros, and interpretive talks by our naturalists. Or, sit back and enjoy a book from the library, watch the dolphins swim, relax in the jacuzzi, or gaze at the equatorial sky from the deck. Non-photographer spouses, partners, and friends are welcome! This is a perfect workshop to bring them with you on, as long as they love nature and the outdoors, they'll have a blast! Everything is all-inclusive so you don't have to worry about anything but taking and making great photographs. With a small group, a brand-new luxury yacht, and amazing pro photographers leading, this trip is sure to fill up fast, so click the "Sign Me Up!" button and we'll see you in The Galápagos! Watch the short video below to get some more insight into this workshop, and take a look at all the photos in the gallery at the bottom of this page. Walk 2 hours on smooth trails, get in/out of zodiacs onto beach, stepping into water. NOTE: This itinerary is subject to change due to park rules, weather conditions or other reasons. May 19, 2019: Arrive anytime this day in Guayaquil, Ecuador. Take the hotel shuttle or a taxi to our hotel in town. Relax and unwind. May 20, 2019: We will have some informal shooting in Guayaquil, capturing this beautiful coastal city of Ecuador. We'll head out after breakfast and return to the hotel later in the afternoon. We'll all meet at 6:00 PM in the hotel lobby, and head out to our group welcome dinner. May 21, 2019: After breakfast we will head to the airport for our flight to The Galápagos, San Cristobal Airport. We will transfer immediately to our private yacht and begin our cruise. We will have stunning views of Kicker Rock. This striking rock formation is located a couple hours off the western shore of San Cristobal. Jutting out of the water, the rocks stand vertically at hundreds of feet above the ocean divided, by a small channel. Although there are no landing areas, kayaking and snorkeling allow visitors to spot a variety of marine life. We could find and photograph sharks, tropical fish, turtles, manta rays, hammerhead sharks, spectacular rock formations, sea birds, blue-footed boobies, Nazca boobies, and frigatebirds. May 22, 2019: Our morning will be at North Seymour Island. 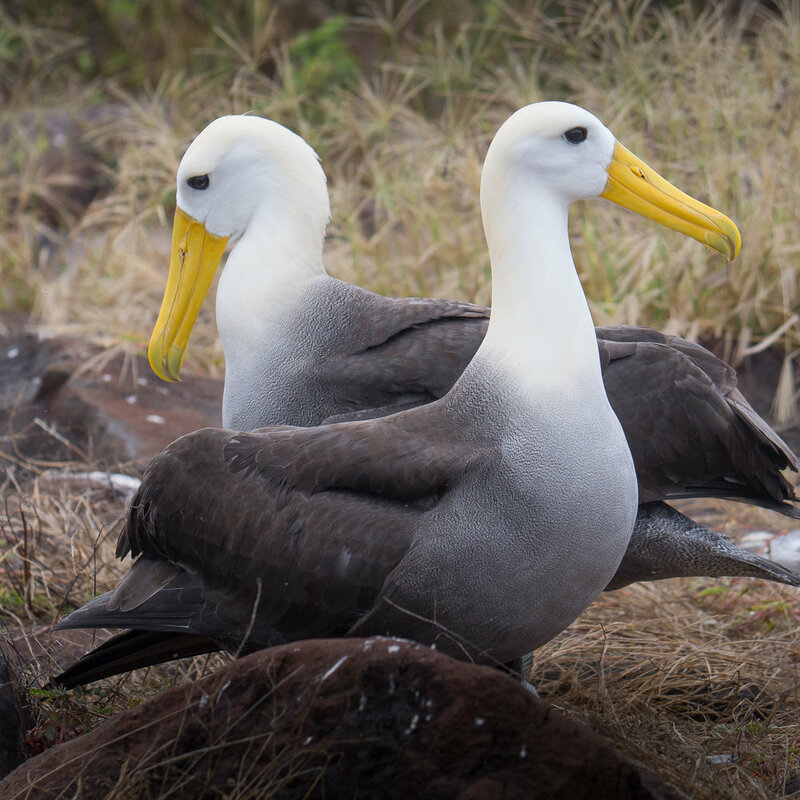 Galápagos sea lions, blue-footed boobies and magnificent frigatebirds are abundant on North Seymour Island. The island was formed by a series of submarine lava containing layers of sediment that were uplifted by tectonic activity. The island is characterized by its arid vegetation zone. In the afternoon we will head to South Plaza Island. This small island with steep cliffs was formed by rising lava and is now covered by Opuntia cacti. It is also home to one of the largest sea lion colonies as well as colorful yellow and red land iguanas. The most characteristic plant is Sesuvium. During the rainy season its color is a greenish to yellowish tone and in the dry season (end of June through January) a bright red. May 23, 2019: Rabida Island (Jervis) is one of the most colorful and volcanically varied islands in the archipelago, and a great snorkeling site. Its famous maroon sandy beach and stunning lookouts provide wonderful landscapes. The island is a birdwatcher’s delight. Some of the rarest species are in abundance, such as nine varieties of finches, large-billed flycatchers, Galápagos hawks and brown pelicans. In the later afternoon we will land at Bartholomew Island. Home of the famous Pinnacle Rock, Bartholomew consists of an extinct volcano with a variety of red, orange, black, and even green volcanic formations. A trail of stairs leads to the summit of the volcano, boasting one of the best views of the islands. The beach is perfect for snorkeling and possible sightings of the Galápagos penguin. May 24, 2019: On the island of Santiago, we stop at Sullivan Bay. A coral beach landing leads you towards a lava field stretching as far as the eye can see. Hunt and peck over the two distinguished types of lava, pahoehoe, and 'a'a, for signs of plant life that have managed to emerge over the past 100 years since the most recent volcanic explosion. A truly amazing volcanic experience—up close and personal! Then we're off to Dragon Hill. Situated on Santa Cruz Island, Dragon Hill is one of the newest visitor sites accessible to tourists in the Galápagos Islands. 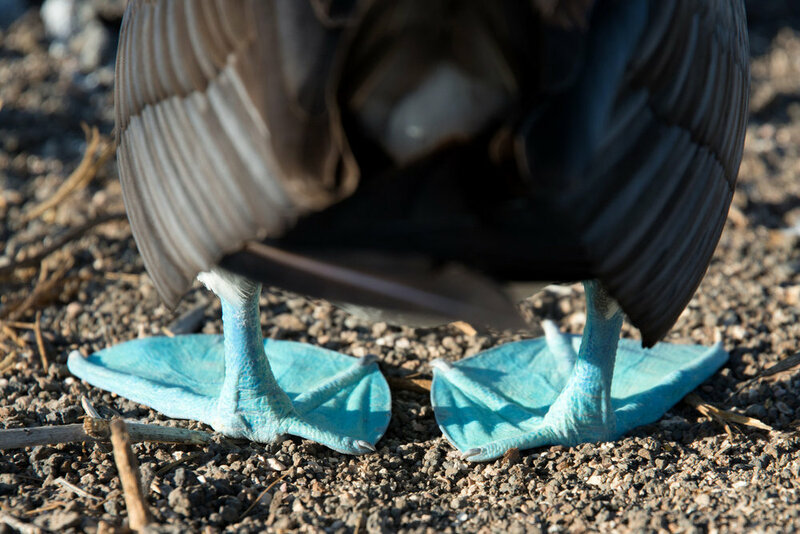 One of the lengthier Galápagos walking trails will lead visitors along a beach and up a trail to the lagoon lookout where bright flamingos, pintail ducks, and land iguanas can be spotted. May 25, 2019: Santa Cruz. Los Gemelos, or the Twin Craters, are located opposite each other on both sides of the road leading from Puerto Ayora to Baltra. The name is only figurative; not real craters, these formations were created by the collapse of surface material in underground fissures and chambers. The view is breathtaking. After lunch we'll be at the Charles Darwin Station. The Charles Darwin Research Station is home to turtles ranging from three inches (new hatchlings) to four feet long. Subspecies of turtles interact with one another and many of the older turtles are accustomed to humans stretching out their heads for a photo opportunity. The babies are kept until they are about four years old and strong enough to survive on their own. May 26, 2019: Genovesa. Our first stop here is El Barranco. Also known as Prince Phillip's Steps, El Barranco’s steep, rocky paths leads up to a high cliff-face with a marvelous view. This site is also home to palo santo vegetation as well as red-footed boobies, short-eared lava owls, Galápagos swallows, and Galápagos doves. Our afternoon landing will be at Darwin Bay. This white sand coral beach heads a half mile trail (0.75km) that winds through mangroves filled with land birds. Nazca boobies, red-footed boobies, and swallow-tailed gulls can be spotted here. Further down the path are tidal pools where sea lions swim playfully. At the end is a spectacular view off a cliff. May 27, 2019: Isla Santiago. 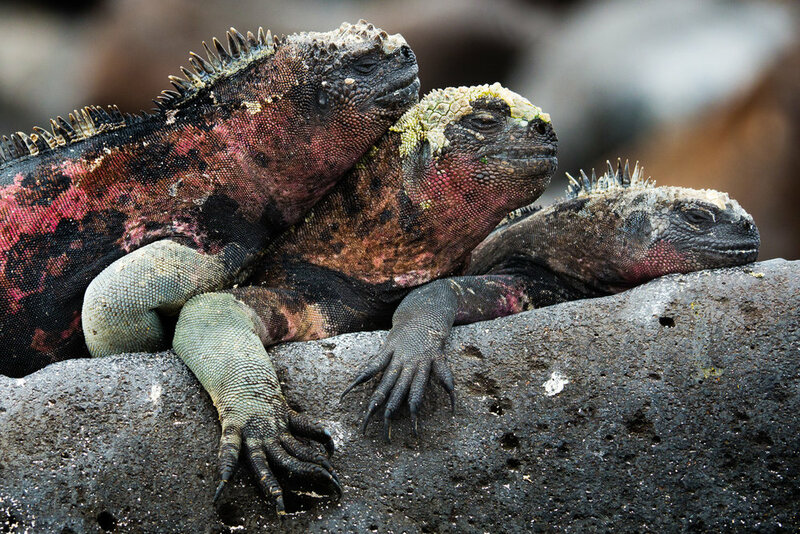 In the morning we visit Espumilla Beach, a popular place for marine iguanas and Sally Lightfoot crabs. The crabs attract the hunting herons performing the dance of predator and prey. With an abundance of marine life including octopi, moray eels, and sharks, snorkeling is highly recommended. After lunch we will head to Egas Port. 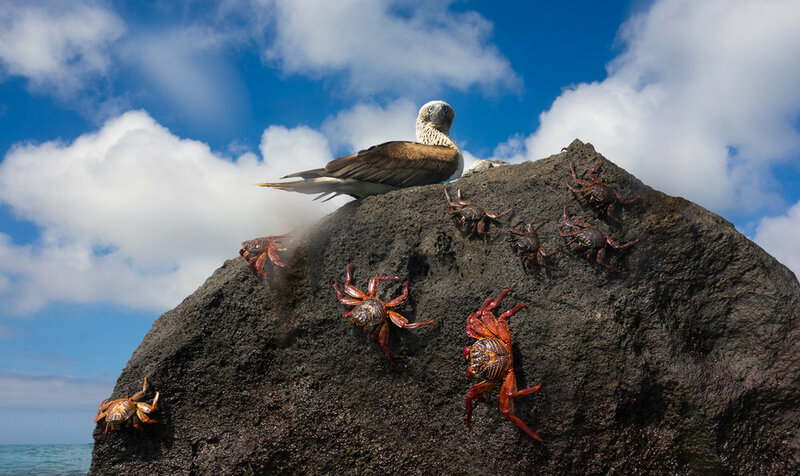 Also known as James Bay, Egas Port is home to the curious Galápagos hawks and quick-footed Galápagos lava lizards. The trail leads to a coastline with gorgeous tide pools and grottos full of fauna. Here the Galápagos fur sea lions bathe in the sun. This is also a great snorkeling site. May 28, 2019: Our morning landing will be at Bachas Beach. Located on the north shore of Santa Cruz, Las Bachas is a swimming beach. One of the few remnants of the U.S. World War II presence in the Galápagos, a floating pier, can be seen here. You may see flamingos, Sally Lightfoot crabs, hermit crabs, black necked stilts, and whimbrels. Sea turtles also nest off the beach. Afterwards we will leave our yacht and transfer to the Baltra Airport for our flight back to Guayaquil. We should be back in Guayaquil by approximately 2:30 pm Flights home can be anytime after 5:00 pm, or anytime on May 29, 2019. We will arrange hotel room for you in Guayaquil if you are staying over on this night. International flights to/from Guayaquil, Ecuador. Airport transfers (hotel shuttle available, and also cabs are inexpensive). Passport and visa fees. Travel Medical Insurance and Medical Evacuation Insurance (required). Trip Cancellation Insurance (optional). Meals in Guayaquil other than dinner on May 20, 2019. Hotel room in Guayaquil before May 19, or May 28 or after. Alcoholic beverages, and any items of a personal nature. Anything not specifically listed as included. Your deposit of $3,500 will hold your place in this workshop. Further deposit of $3,500 is due by September 1, 2018. The balance will be due not later than February 1, 2019. All payments are non-refundable which is why you should have Trip Cancellation Insurance. All of our other normal Terms and Conditions apply. 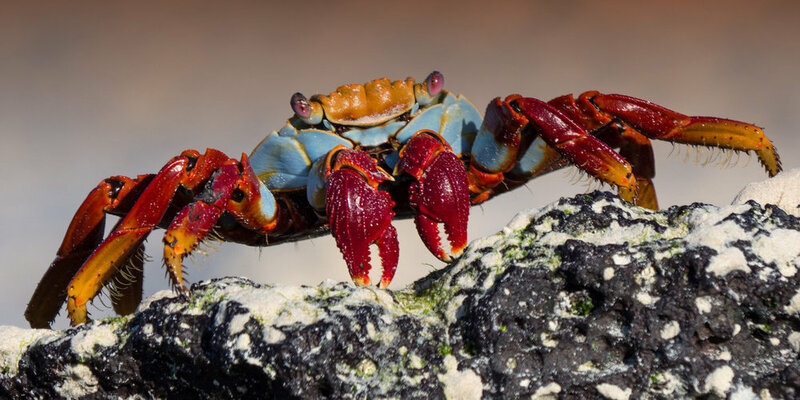 If you're looking for a small-group, intensive photographic Galápagos trip aboard an amazing private yacht with the best pros and naturalists in the business, look no further and click the "Sign Me Up! button now because this workshop will sell out fast. See you in the Galápagos!